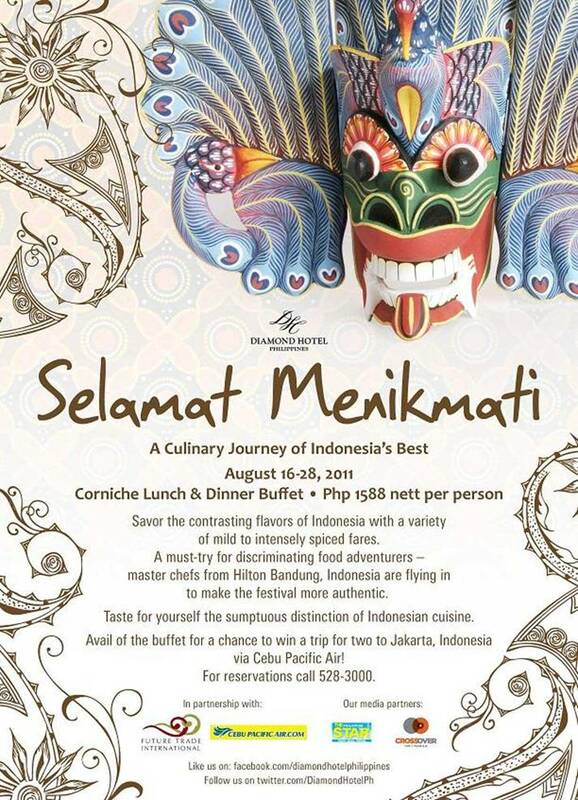 Feast on a sumptuous buffet, best treats, best foods and most of all best price!! It was a feast like no other, a feast fit for a king. On the far reaches of Banawe st. in Quezon City a Chinese restaurant is making waves with the Chinese community. And this time the rumors are true. We have been a regular visitor of King Chef Restaurant and every visit was a memorable one, especially this. We were invited to partake in an Imperial feast, showcasing the best that King Chef has to offer. Some of the guests who answered some trivia questions were lucky enough to have a taste of "King's style Buddha Jump over the Wall" soup which cost around P9,000 for a table of 12. And also a group of guests also got the chance to savor genuine "King Chef braised superior sharks fin soup" good for one at P1288. And guest what we were the lucky ones!!! Oh.. sharks fin soup, so deliciously good. Our serving per bowl was so big, I was so full from that alone, mixed with red vinegar, gives out the flavor that I have missed for quite some time, and I must say only from genuine sharks's fin can give that one-of-a-kind taste that the world has gone mad over. A select few fashion and food bloggers were invited to partake in a private degustation at FEVER Luxe Lounge at Sofitel Philippines. It came as a surprise for me, as I have heard that Fever Luxe Lounge is where all the hippest parties in the metro are held. So I was kinda expecting a "gimik" night with lots of sumptuous food. But boy was I wrong. At first glance, I was amazed how the place had a total facelift from the previous "7 Pecados", which was the night hangout to serve cocktails and groove to dance music before at Sofitel Philippines, I still remember the days when we used to spend nights here and drink away. Fever Luxe Lounge takes it to a new level of partying with the posh lights and disco sounds to dance the night away. 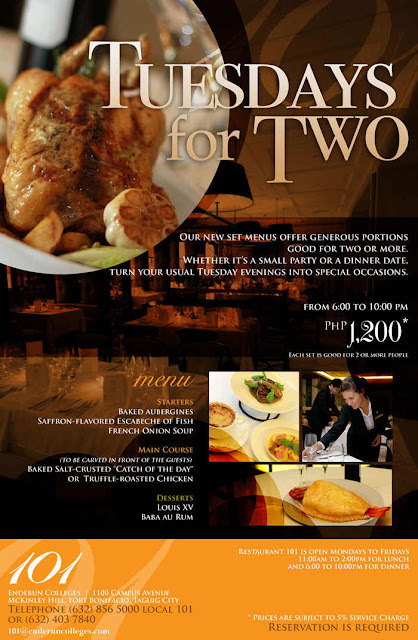 But before the music starts playing and the alcohol starts flowing, Fever sets the mood right for nights of full dining pleasure, a smart dining experience, the French way. Get to win FREE tickets to the biggest SALE event of the year "BEST DEALS on SALE" brought to you by Malibu Enterprise and BDO. And with such, BDO cardholders (with a valid ID) get in for FREE!! Lucky you! First 3 hours of the Friday sale (10am-1pm) exclusive to BDO Cardholders Only. BDO Cardholders also get chances to win in the hourly raffle draws with a minimum P500 Chargeslip from the event. But if you don't have a BDO Card, well there is an entrance fee of P50. But here's more good news, The Food Alphabet will be giving away 5 pairs of tickets to 5 winners (2 tickets each) to this grand SALE event. Well I would say "Lucky You". How to get these tickets? must like The Food Alphabet and Best Deals on Sale by Malibu Ent. on Facebook. Click on the FB share button on top of this post and Post this on your wall "I will get the best deals on (Tag) @Best Deals on Sale by Malibu Ent. with my friends (Tag) @friend1 and @friend2 with FREE tickets courtesy of (Tag) @The Food Alphabet." Tweet this "I want to go to the Best Deals on Sale by Malibu Enterprise with FREE tickets from The Food Alphabet. http://bit.ly/o33WI6 "
Post your FB post link and Twitter post link on the comments section of this post with your full name and email address so that I may contact you if you win. Winners will claim their tickets on the venue itself during the 3-day sale event. One person, one entry only. Post that are set to private or cannot be seen by me will not be able to qualify. 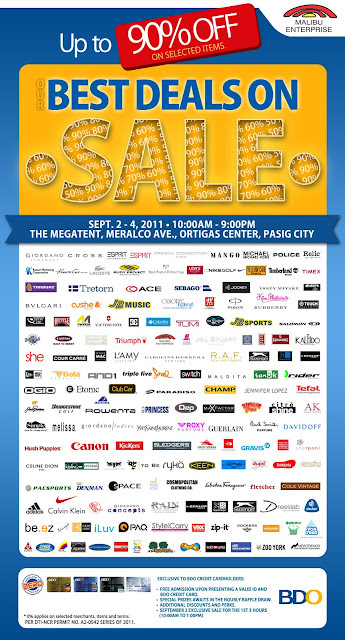 See you at the BEST DEALS on SALE at The Megatent!!! 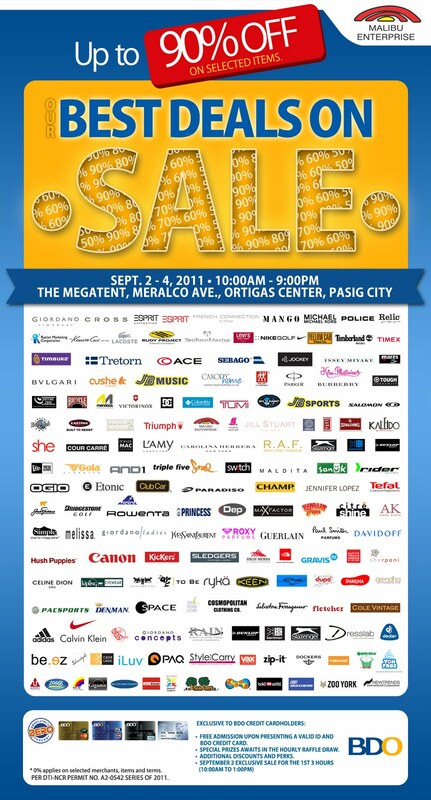 More chances to win tickets to the SALE at Manila Life. Everyday, I always take the route of Dapitan St. passing by University of Santo Tomas (UST), going home. I always take notice of the many food stalls, many food shops and fast food joints serving the student populace of UST, thinking oh I miss student meals, student foods and you know junk foods such as fish balls, squid balls, tukneneng (fried quail eggs in orange batter), even the scramble (crushed ice in flavor with powdered sweet milk) which is again making waves. Then something caught my eye. A small store along Dapitan St. named Simple Line. A long cue line scaled from the already crowded store opening. I keep on thinking and wondering what was in there? Is there a lotto selling outlet there? Haha, I though it could not be as the place was near UST. And so I gave in to my curiosity and finally parked my car near it after weeks of just passing through. Finally, I got there and alas it is a milk tea place. Hmmm... I keep on thinking how can such a small place selling milk tea variants have so much customers and don't even have a place for their guests to sit it, and yet having crowds of students lining up to have a sip. And so I was thinking, it must be good. Upon entering and fighting my way through the line, there I was surprised on how small the store was indeed, but they had all they need to serve up milk teas for take away that is. First thing upon entering, I was able to browse around their menu, and just in case you are a milk tea virgin, they have also on their boards their best selling milk tea variants and their fruit tea concoction variants which you could choose from. Their milk tea and fruit tea variants are either Black Tea or Green Tea based, and everything else is almost customized, as in other milk tea stores you have the option to choose your sweetness level. So if you want it not so sweet, you really have to tell it upon ordering of you will be getting your milk tea in 100% sugar. Other options are the add ons which you would like your milk tea to have such as tapioca (sago), Herbal jelly (pudding), coconut jelly (nata de coco) and coffee konjac (P10) (coffee jelly). Your milk tea add-ons all depends on you and you can always have more add-ons with your milk tea, well for a little extra charge of P5.00 that is. My top favorites for the Simple Line milk tea place includes Tapioca Black Milk Tea, Caramel Black Milk Tea and Coffee Konjak Black Milk Tea and more. I have yet to taste all the other flavors which include Oolong tea but hopefully soon. The Coffee Konjak Black Milk tea was perfect for me during my sleepy afternoons as it gave me that kick (caffeine from coffee jelly and black tea) that I needed to finish a fruitful day at the office. My usual milk tea place, offers good milk tea at fairly a premium of a price which most students in fact cannot afford, even me as a part of the working class may limit myself to only a few servings in a month. But with Simple Line (a.k.a. Simple Life), I can have my daily milk tea serving at only P60.00 for the large cup. Yes P60.00!!! really great price for great tasting milk tea, P45 for medium cups. Just a warning though and don't say I did not warn you guys... it is very addicting. And my favorites for now? the Coffee Konjak Black Milk Tea and Caramel Black Milk tea with pudding (gelatin). Simple Line has 2 branches in UST, one in Dapitan Street, the other in V. Concepcion Street. They have 2 other branches in the metro, one in CEU (Centro Escolar University) along Mendiola St. and one near St. Scholastica's College in Leon Guinto St. Have a taste of great milk tea for less at Simple Line milk tea. Congratulations to the following winners, expect an email from me soon, informing of your winning entry and how to receive the prizes. Thank you all for joining and hoping you could join in future giveaways of The Food Alphabet. Built-in cooking products offer a wealth of convenience in the kitchen and Whirlpool finally launched this product category here in the Philippines. As part of its 100th anniversary celebration, Whirlpool is introducing this new and complete line of built-in cooking products to complete their product line-up. Composed of various models of hobs, range hoods and oven, Whirlpool’s Built-in cooking line features a stainless steel surface, exquisite design and unmatched functionality, much to the delight of discerning homemakers. And in celebration of 100 years of creating happy memories with Filipino families, Whirlpool is inviting homemakers to share their cherished family recipes for a chance to have it published in Whirlpool’s 100 Family Recipe Collection. To join, simply email your recipes to whirlpool100familyrecipes@yahoo.com with your name, address, age and contact details. You can send up to two recipes and they must have a story to tell, is enjoyed by your own family, easy to cook, can serve 4-6 persons and use ingredients that are readily available in the market. Brevity is important so please limit your story to 25 words. Whirlpool will select around 50 family recipes that will be featured in Whirlpool’s 100 Family Recipe collection and you can even get the chance to win a Whirlpool Built-in cooking product. The 100 Family Recipes Collection is part of Whirlpool’s “Just Like Family” campaign, which aims to bring the message across that Whirlpool will forever be a part of the family. Since its appliances have always found a place in a family’s home by being useful and dependable, Whirlpool has become an integral part of the home and the family and has and will always be a constant and reliable partner in forging memories that come with each treasured recipe. So start thinking of that winning family recipe that’s a surefire palate pleaser and share it with the rest of the world. Contest runs from July 30 – September 10, 2011. 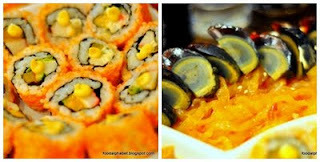 This promo is made possible with the support of Ajinomoto, Yummy and Good Housekeeping magazines. 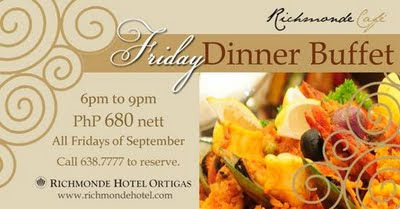 For more info on Restaurant 101, please visit their website http://101.enderuncolleges.com/ for more promos as well as their curriculum for Enderun Colleges. Savor delicious food done the Enderun way and have a taste of their chocolate concoction Louis XV, he will take your heart away. Restaurant 101 at Enderun Colleges is open from Monday to Saturday; from 11:30am to 2pm for lunch, and from 6 to 10pm for dinner. The Chinese ghost month, happens once a year during the 7th month of the Chinese Lunar calendar, it has been a tradition in the family to have Chinese Lumpia or simply lumpia in our house especially on the 15th of the ghost month. I don't know if its really a tradition amongst Chinoys, but I'm sure glad we have this in our family. Yes indeed, you can buy a lumpia in Manila anytime, but from all the lumpia that I have tasted, going over to my aunt's house to have a taste of their lumpia still excites me. I can still remember my teenage times where I can actually finish 6 rolls of lumpia, but I was nowhere close my cousin being able to finish 9 rolls already while making another one, haha. Fresh Vegetables! Be sure to clean your vegetables, these veggies are vital as they are nutritious and also serve as the second layer of your lumpia after the wrapper. then comes the main ingredient, the lumpia filling mix.which as what I can taste are squid, cabbages, carrots, a little ground meat and of course the family tradition way of cooking this which I really don't know. You can even eat this dish without the wrapper, just make it as a dish to rice and you will be satisfied. After scooping for the lumpia filling, we add grounded nuts and sugar all over to put a little sweetness to our lumpia. start eating and enjoy, after this year, I will be looking forward for to next year's family lumpia feast. Happy Eating!! I recently went to Malate in Manila to look for something to eat, thinking with so many tourists here, there should be a lot of good Japanese and Korean restaurants here. Yeah, I'm a fanatic of Japanese food. And so as I was passing by Adriatico, I noticed a sign Tanba Buffet, and I remembered seeing this on Facebook as recommended by my friend who recently tried it. So I said why not give it a try. Tanba Buffet is located as part of a hotel along Adriatico St., ample parking space and best of all no parking fee hehe, it was quite an inviting sight even though it was pouring rain that night. So this is the buffet area, hmmm.... at first sight, I felt that it was such a small buffet area, but as I went through with the buffet items for Yakiniku, they were more than enough. So here we are in the mighty Boulevard Diner, it is such a cool and cozy place to chill, adding to the excitement the scent of freshly grilled beef patties and eagerly waiting to kick off that one heck of a food feast!!! Now to kick off things we present to you SHA-ZAM! (P195) A one-of-a-kind burger! Feast your eyes on 1/3 lb 100% beef burger patty sitting pretty with lettuce, tomatoes, eggs over medium, white cheese, beef, crispy cured bacon, hickory sauce and a stack of fried potato strings! The question on your mind I would think is how do you eat this 3-inch high burger? Well, the best thing to do is to stack the upper bun and press it down, til you can hold by your hands, then its SHA-ZAM time. I would like to showcase some choice burgers that will surely tickle your taste buds, let me take you to a tour of gastronomic proportions. The Hero Burger(P120), the original customize your burger, with choices of toppings such as cheese, bacon, mushrooms, eggs over medium, potato strings, grilled pineapple, sauteed pepper and onions and even Parmesan cheese. Or you can choose from Boulevard Diner's signature burgers. Larry Lana'i (P175), all the goodness of burger with a little twist of sweetness, thanks to that pineapple slice. The Notorious NutJob (P180), nutjob is definitely the word, with peanut butter and bacon and red onion rings, this will surely melt things in your mouth. chicken thigh fillets, TLC and coleslaw, one of the other chics in Boulevard Diner. The Grinch (P190) another great creation with guacamole in mind. Volcanic Viktor (P170), one of the deadliest and the most tasteful of them all, with bacon, fried onion rings, and chipotle mayo, is a masterful combination of crisps and bites. Now have I made you hungry? Haha, sorry about that, now here comes the exciting part of this post, the Boulevard Diner GC giveaway!! Yes, after looking at all those delectable burgers, here is your chance to taste them for FREE!! Three (3) winners will be getting P400 worth of Boulevard Diner GC's each. 1. ) 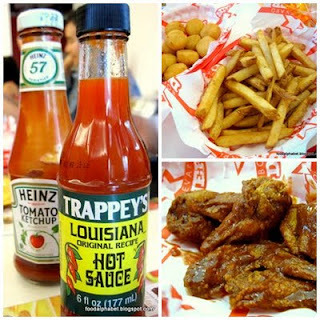 As a requirement you must like Boulevard Diner and The Food Alphabet on Facebook. 2.) Visit the Boulevard Diner FB and browse over the menu, after which using the FB SHARE button on top of this post, Type "I want to have a taste of (your choice of burger) at (tag) @Boulevard Diner with my friends @Friend1, @Friend2, @Friend3, Thanks to @The Food Alphabet." - if you want to check if you have done this correctly, your post must be visible on Boulevard Diner's Wall and The Food Alphabet's wall. 3.) Tweet this promo on your twitter "I want to win Boulevard Diner GC's from The Food Alphabet http://bum.ph/s"
4.) Post a comment below with your FB post link and Twitter post link with your full name and email address so that I can contact you when you win. Remember you have to have both links to be eligible to join the giveaway. 5.) The Boulevard Diner GC giveaway from The Food Alphabet will be ongoing starting today to Aug. 15, 2011 (Monday) 12MN. Only one entry per person. So post those comments now!! It's that simple! I will deliver the GC's to you at no cost. 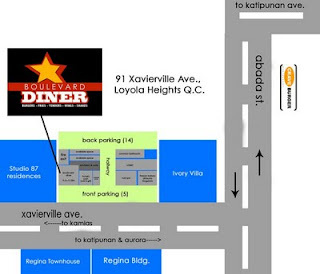 So that means only NCR residents can join unless you always come to Quezon City, since Boulevard Diner is located in Xavierville Av., Loyola Heights Q.C. So if you can't wait for these GC's or you just want to try Boulevard Diner right now. Go give in to your cravings, but just in case you may get lost like I did, here is the map going to Boulevard Diner. 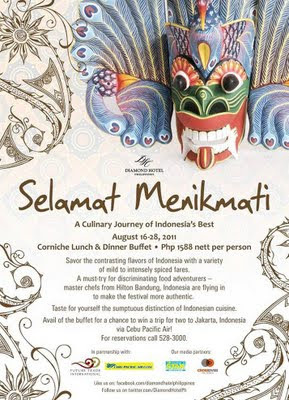 Enjoy and have a great feast!